This series has summarized radioisotope dating models, their assumptions, and how those assumptions mistakenly lead to a “deep time” picture of our universe.1 Secularist scientists want us to accept their circular arguments and improbable assumptions as scientific fact, despite the fact these same scientists often push aside the scientific method itself. Using the various types of radioisotope decay as clocks does not produce consistent results, nor are those results verifiable by observational evidence. If these methods do not properly date rocks of known ages—some less than a century old—how can we trust them to date rocks of unknown ages? 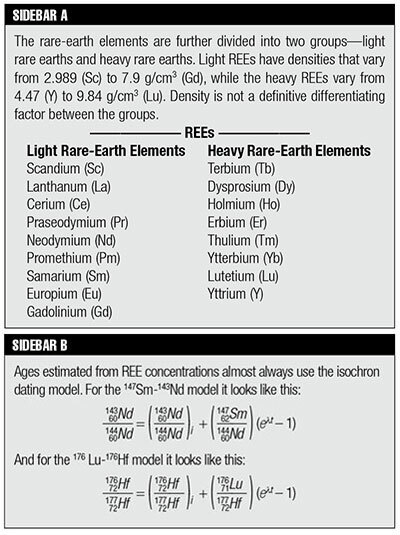 Last month we discussed dating methods using rare-earth elements (REEs), a group of seventeen metallic elements—i.e., the lanthanides plus scandium (Sc) and yttrium (Y). The 147Sm-143Nd model has a problem the previous models we have discussed do not have—i.e., 143Nd is only observationally stable; it is theoretically predicted to undergo alpha (α) decay to 139Ce. Furthermore, the index isotope 144Nd alpha decays to 140Ce with a half-life of approximately (2.29± 0.16) × 1015 yrs. Geochronologists solve this problem by using “stony meteorites” to establish a primordial isotope ratio for 143Nd to 144Nd and an estimated age of (4.58±0.05) × 109 yrs using the Moama meteorite as a reference standard.2 This method assumes that the terrestrial Nd has evolved in a uniform reservoir whose Sm/Nd ratio is equal to that of a chrondritic meteorite that is further thought to be similar in composition to the current photosphere of the sun minus the volatile elements. Hence, the logic used to estimate the initial value of the daughter isotope concentration springs from the evolutionary models for solar system formation and is, again, quite circular in its essence. must be determined from other dating methods. Even then, the scatter of the data points for the isochron is usually significant, perhaps hinting that the linear plot more closely models a mixing line than an isochron. Rare-earth dating is plagued by the same questionable four assumptions as the K-Ar, Ar-Ar, and Rb-Sr dating methods,3 and the rocks they supposedly date continue to exhibit behavior that is just as consistent with a mixing line as an isochron line. Half-lives, which figure prominently in date calculations for the REEs, have a high degree of uncertainty, and the methods for measuring the primordial concentration ratios exhibit circular reasoning. Another assumption that is seldom mentioned is the issue of continuing cosmogenic production of both parent and daughter isotopes in all these aforementioned dating methods. For example, 142Nd is continually produced via the alpha decay of 150Gd, and it in turn continually produces 143Nd via neutron capture reactions from solar radiation. Since 147Sm decay produces only tiny amounts of 143Nd, even small amounts introduced via a process like neutron capture will seriously skew the dates estimated with the 147Sm-143Nd method. All these factors cast significant doubt on the accuracy and reliability of these methods for dating rock formations. So what else do the observations say about these REE dating methods? Two isochrons from Grand Canyon’s Bass Rapid’s diabase sill and contact hornfels are discordant by a factor of 2—the diabase mineral isochron giving an age of 1376±140 Ma and the granophyre + hornfels isochron giving an age of 676 ± 280 Ma.6 Which one is correct? Finally, the measured isochron ages of amphibolite rock from southeast India gave an age of 481 million years using the Rb-Sr method but an age of 824 million years using the Sm-Nd method.11 The researchers explained away the obvious disagreement by claiming the older age was the time at which the rocks underwent metamorphism while the younger age resulted from a later heating of the rocks. How do they know this time sequence? Can they time travel? They are using unknowns to explain unknowns. This is blind faith wrapped in a philosophical premise, not science. Speculation, conjecture, and reasonable hypotheses all have their place in the scientific process, but they are not scientific fact and should never be presented as such. The secularist will tell us that believing the biblical account of creation is not science, even though the preponderance of the observational evidence points to the truth of the Genesis record. Unfortunately for them, secularists’ worldview of a matter, energy, random-chance universe (naturalism) is also a matter of belief, not science. Do we believe God, whose Word has stood the test of time, or do we believe self-appointed experts who have a long history of mistaken ideas and bankrupt philosophies? Cupps, V. R. 2014. Clocks in Rocks? Radioactive Dating, Part 1. Acts & Facts. 43 (10): 8-11; Cupps, V. R. 2014. The Iconic Isochron: Radioactive Dating, Part 2. Acts & Facts. 43 (11): 10-13; Cupps, V. R. 2014. The Noble Clock: Radioactive Dating, Part 3. Acts & Facts. 43 (12): 10-13; Cupps, V. R. 2015. Alkali Metal Dating, Rb-Sr Dating Model: Radioactive Dating, Part 4. Acts & Facts. 44 (2): 10-13; Cupps, V. R. 2015. Rare-Earth Clocks, Sm-Nd and Lu-Hf Dating Models: Radioactive Dating, Part 5. Acts & Facts. 44 (3): 10-11. Hamet, J., et al. 1978. Origin and history of the adcumulate eucrite, Moama as inferred from REE abundances, Sm-Nd and U-Pb systematics. In Proceedings of the 9th Lunar and Planetary Science Conference. New York: Pergamon Press, 1115-1136. Cupps, Clocks in Rocks?, 10. Davidson, J., et al. 2005. Mineral isochrons and isotopic fingerprinting: Pitfalls and promises. Geology. 33 (1): 29-32. Bowring, S. A. and T. Housh. 1996. Response: Sm-Nd Isotopic Data and Earth’s Evolution. Science. 273 (5283): 1878-1879. Snelling, A. A. 2005. Isochron Discordances and the Role of Inheritance and Mixing of Radioisotopes in the Mantle and Crust. In Radioisotopes and the Age of the Earth: Results of a Young-Earth Creationist Research Initiative. Vardiman, L., A. A. Snelling, and E. F. Chaffin, eds. El Cajon, CA: Institute for Creation Research, and Chino Valley, AZ: Creation Research Society, 451. Snelling, A. A. 2003. The relevance of Rb-Sr, Sm-Nd, and Pb-Pb Isotope Systematics to Elucidation of the Genesis and History of Recent Andesite Flows at Mt. Ngauruhoe, New Zealand, and the Implications for Radioisotopic Dating. In Proceedings of the Fifth International Conference on Creationism. Ivey, Jr., R. L., ed. Pittsburgh, PA: Creation Science Fellowship, 285-303. Morris, J. 2011. The Young Earth. Green Forest, AR: Master Books, 57. Mafic is an adjective used to describe silicate minerals or rocks that are rich in magnesium and iron. Common mafic minerals include olivine, pyroxene, amphibole, and biotite. Snelling, A. A. Whole-Rock K-Ar Model and Isochron, and Rb-Sr, Sm-Nd, and Pb-Pb Isochron, “Dating” of the Somerset Dam Layered Mafic Intrusion, Australia, Proceedings of the Fifth International Conference on Creationism, 305-324. Okudaira, T., et al. 2001. Sm-Nd and Rb-Sr dating of amphibolite from the Nellore-Khammam schist belt, S.E. India: constraints on the collision of the Eastern Ghats terrane and Dharwar-Bastarcraton. Geological Magazine. 138 (4): 495-498. Cite this article: Vernon R. Cupps, Ph.D. 2015. Rare-Earth Clocks, Sm-Nd and Lu-Hf Dating Models 2: Radioactive Dating, Part 6. Acts & Facts. 44 (4).